Photo by Jenny Neyman, Redoubt Reporter. 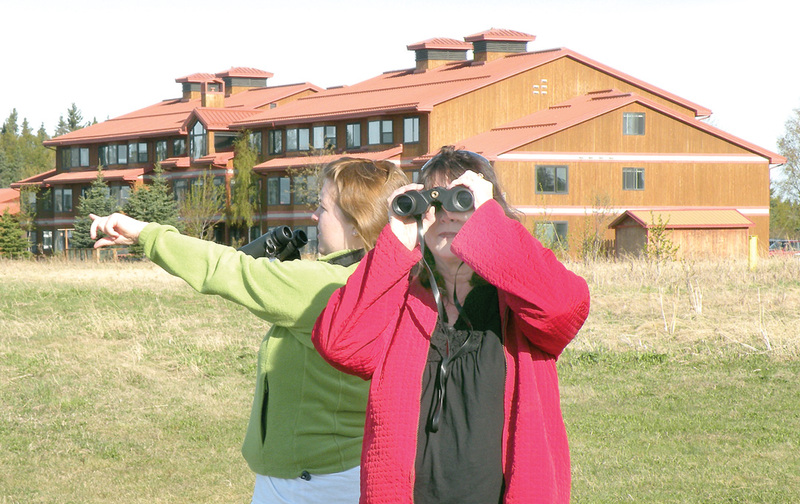 Rebecca Gilman, left, and Debra Dougherty look at gulls on the bluff above the Kenai River near the Kenai Senior Citizens Center on Saturday as part of a tour for the Kenai Birding Festival. At first flush, beginning birding seems both bird-brain easy and overwhelmingly challenging for the exact same reason — birds are everywhere. Spring on the Kenai Peninsula is accompanied by the constant fluttering heartbeat of avian life — flitting, wheeling, swooping, diving, flushing, roosting — and the sweet to cacophonic soundtrack it provides. Being outside and not seeing and hearing birds would be as improbable as floating the Swanson River on a calm, July day without becoming anemic from the mosquitoes. But that’s also the challenge — there are just so dang many birds, how do you tell them apart? There are 274 bird species on the Kenai Peninsula alone, with 18 different gulls, for crying out loud. Not only do birders need to learn to differentiate species visually, but their songs should also be learned. Was that a whoop-whoop-whooooo, or a monotone huuuumm-trill-chirp, or a click-whirr-wheeze, or a wop ba-ba lu-mop, a wop bam boom? Then there are the names to keep track of — semipalmated plover, greater scaup, sooty shearwater. Not the most helpful references. Does a Bonaparte’s gull have something to do with its black head, like Napoleon’s iconic cap, or are they just short and lousy at holding France against attackers? What about a red-necked grebe? Do they sport actual red necks, or have an affinity for broken-down pickups and dating their cousins? Photo by Joseph Robertia, Redoubt Reporter. 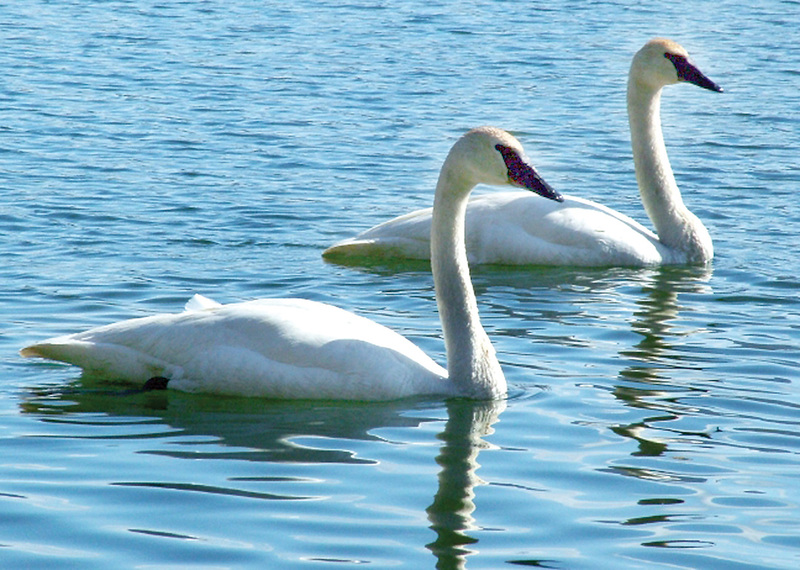 Trumpeter swans glide along Engineer Lake on Saturday. Kenai birders had much to look at over the weekend. Woah there. Bring it in for a landing, would be Ken Tarbox’s advice. 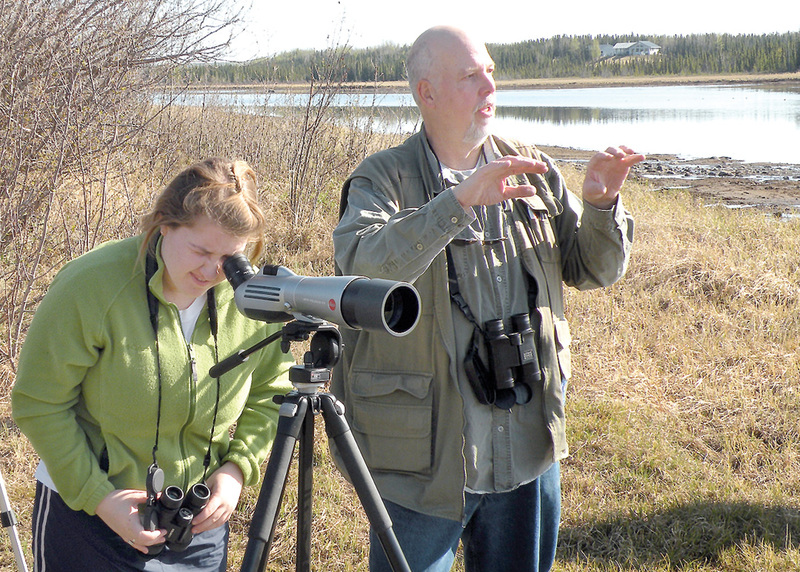 The retired Alaska Department of Fish and Game biologist, and one of the organizers of the Kenai Peninsula Wildlife Viewing Trail Guide, led a beginning birding tour as part of the weekend Kenai Birding Festival on Friday. The goal of the outing was two-fold, to instill newcomers with the fascination and excitement birding can bring, and to get them started without leaving them overwhelmed. When heading into the field — whether the backcountry or the backyard, preparing and packing the proper gear is key, Tarbox said. First, get a good pair of binoculars rated for decent vision in low light, and focus them for your eyes, adjusting only one lens at a time. A spotting scope with higher magnification is also good to bring along. Next, pack reference materials. That way, birders don’t have to know everything, they just have to know how to look it all up. Bring a good birding book — Tarbox had the “Sibley Guide to Birds” — and a bird checklist, such as the “Flying Wild” pamphlet put out by the Kenai Watershed Forum, Kenai National Wildlife Refuge and Keen Eye Birders. If you’re car birding, bring a CD of birdsongs of Alaska to help identify what you’re hearing. If you plan to leave the car behind, bring an MP3 player with birdsongs downloaded. “You’ll hear the birds calling and sometimes it’s much better to find birds by listening to them and say, ‘Oh, it’s over there.’ Then go for it and you already know what it is,” he said. Photos by Jenny Neyman, Redoubt Reporter. Gilman looks through an angle-lens spotting scope at the Moose River while birding guide Ken Tarbox talks about bird behaviors. If an experienced birder is heading into the field, pack a novice. What’s the use of all that birding knowledge if it’s not shared with others? On Friday’s trip, staff from the Kenai Visitors and Cultural Center — Rebecca Gilman, Debra Dougherty and Cathy VanCauwenbergh — were along for the ride in order to see firsthand the birding spots and species they routinely recommend for visitors. “We’re just trying see all these sights that we’re telling visitors to go experience,” Gilman said. For Kasilof residents this spring, all roads north lead to construction. 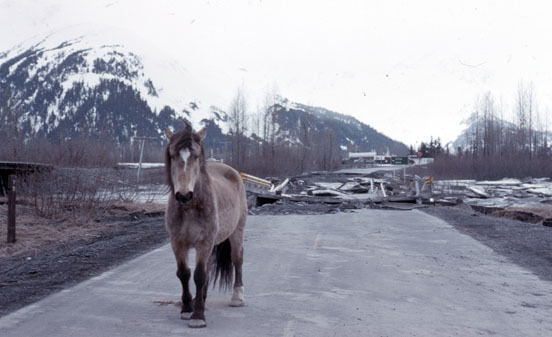 Kalifornsky Beach Road and the Sterling Highway, the only two routes between Kasilof and Kenai, Soldotna and points north, are both under construction. As a result of the current one-lane restrictions and reduced speed zones on both roads drivers have already been experiencing construction-related delays ranging from five to 20 minutes. And K-Beach will soon close for two weeks, but project engineers are optimistic about the future traffic flow. On the 16.7-mile federally funded Sterling Highway project, the top layer paving work —2 more inches of asphalt across the top — began May 12 and is near completion. The project, being done by Alaska Road Builders Inc., involved pre-leveling and paving last year from August to October. As in 2009, construction work is conducted in roughly three-mile sections from Soldotna south to Cohoe Loop Road. The work takes two to three days per lane, and the highway is reduced to one lane during construction hours, with a pilot car guiding traffic through the construction area. Last season the Sterling Highway construction project did not take a hiatus during the Memorial Day holiday weekend, and as scores of motorists were headed south for fishing at one of the southern peninsula rivers’ weekend king salmon openers, clamming or other recreation, traffic backed up for hours in both directions. Tague said that scenario will not play out this year. Work is currently being done Monday through Friday from 9 a.m. to 10 p.m. After the holiday weekend, Tague said construction would switch to evening hours, with work done from 8 p.m. to 6 a.m. Construction is expected to be completed by June 11. This is good news to motorists and businesses in Kasilof and farther south. “We’re putting in a store and a concession stand, so we’re hoping people will come despite any inconvenience,” said Jeff Floyd, manager at Crooked Creek RV Park, off Cohoe Loop Road. Floyd said his busy season hasn’t started yet, and he’s hoping the worst of the construction delays will be done when tourism hits its peak. 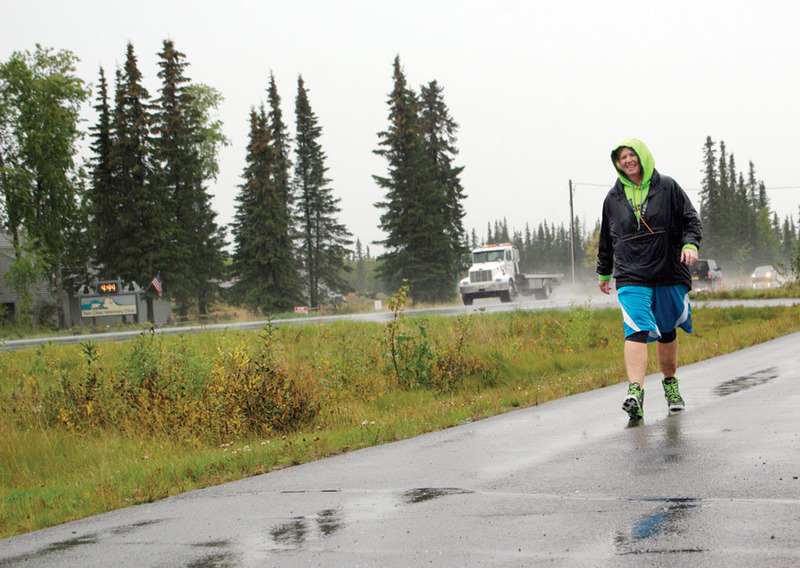 Joe Browning, owner of the Kasilof Riverview Tesoro at Mile 109.5 of the Sterling Highway, said the construction this season is affecting his business far less than last year’s work on the bridge over the Kasilof River. Construction on the Coal Creek project, being done by GMC Contracting Inc., began April 28 and is expected to run through June 16, with the bulk of the work occurring at the beginning of next month. During that time, K-Beach Road from Ariels Lane to Ole Timers Lane will be completely closed from June 2 through June 15. “It’s a very labor-intensive project with a narrow, high embankment,” Walklin said. As a result, there is no right-of-way to create a temporary road around the project area. “A closure was the best option. The further we ran it into summer, the more of an impact it would have on the fishing and tourism industries,” he said. While still open, motorists can expect one-lane traffic from 7 a.m. to 7 p.m., but residents of the area say they haven’t yet seen much delay. The purpose of the project is to replace the existing 9-foot hanging culvert beneath the road with an 18-foot diameter, 190-foot-long pipe in an effort to enhance fish passage through Coal Creek. Rehabilitation of the adjacent creek bed and bank will also be completed, said Robert Ruffner, executive director of the Kenai Watershed Forum. Ruffner said he has high hopes for the outcome of the project. A few other roads projects are planned so far for this summer, including a paving project in the Johnson Lake, Crooked Creek and Tustumena roads areas, and installation of a bike-path extension along K-Beach Road from Bridge Access Road. Weekly updates on roads projects can be found at http://www.alaskanavigator.org, or for more information, contact DOT at 262-2870. Photo courtesy of Mayme Ohnemus. 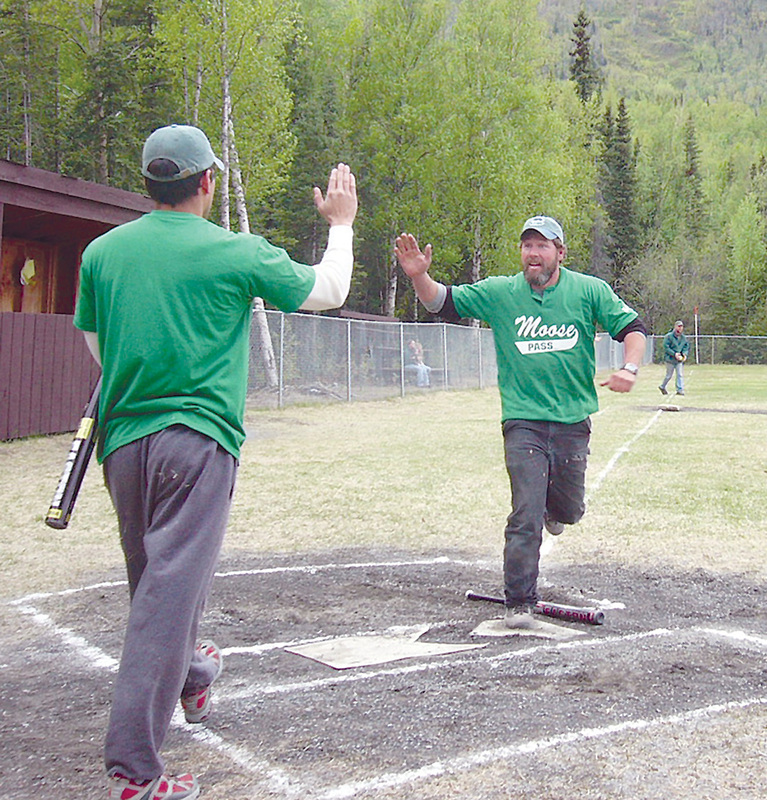 A Moose Pass player comes in to score in a recent Cooper Landing Community Softball Tournament, which has been going on since 1995. The hard-luck story of the Float-N-Fish team in the Cooper Landing Community Softball Tournament went almost all the way back to the tourney’s inaugural season in 1995, but it ended decisively last June 7 when Float-N-Fish defeated Mountain Madness 6-5 in the championship game. Float-N-Fish had defeated Moose Pass, Alaska Wildland Adventures, Princess Lodge and Mountain Madness in quick succession to open the double-elimination slo-pitch tournament. Then, atop the winner’s bracket, Float-N-Fish had to await the survivor of the loser’s bracket, which turned out to be Mountain Madness. Formerly a Forest Service-based team from the Moose Pass/Crown Point area, Mountain Madness then defeated Float-N-Fish 7-4 to force a decisive final game. The title, and the traveling trophy that goes with it, marked the first time Float-N-Fish had won more than a single game in the tournament, and it was emblematic of the way that the wealth (i.e., victories and titles) has been spread around in this event, which takes place in the decidedly rural environs of the upper Kenai River valley. Since the 10-day, 10-team tournament began on the field adjacent to the Cooper Landing Community Hall, no team has won more than two titles. Float-N-Fish, on the other hand, had struggled to win at all until 2009. The first incarnation of Float-N-Fish began in 1996, when the original owner of Cooper Landing Floating & Fishing, Howard Mulanax, first sponsored a team. The Float-N-Fish team played until 2002, when Mulanax retired from guiding and allowed the team to fold with an all-time mark of five wins and 14 losses, which included two winless tournament appearances. 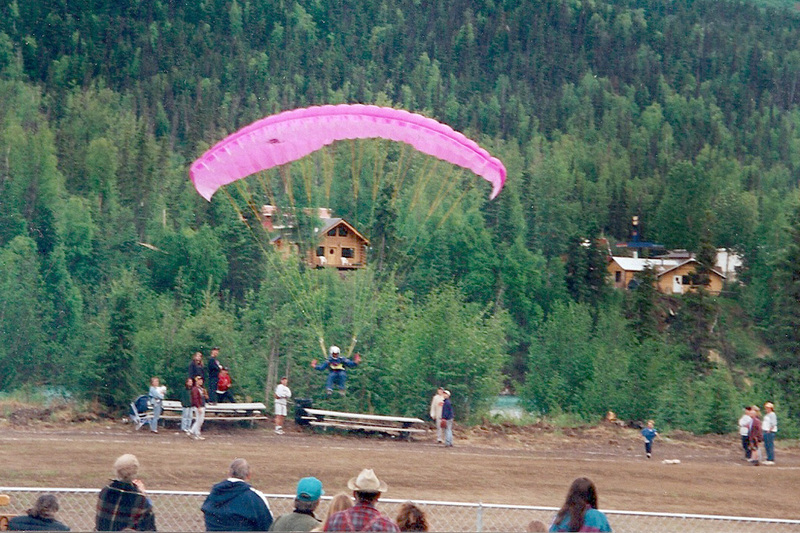 For “entertainment” during the 1997 tournament, Darwin “Pete” Peterson glided onto the softball field during a game. 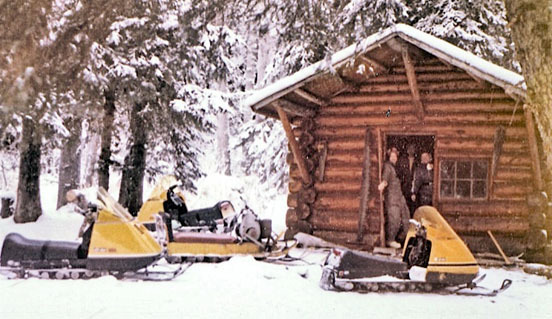 Peterson and his brother, Andy, had launched themselves off Cecil Rhode Mountain across the Kenai River. Andy landed at the nearby Cooper Landing rifle range. Two of Mulanax’s former players, Heather and John Pearson, took over the guiding business in 2005, renamed it Kenai River Float-N-Fish, and re-started the team — with similar results, at first: three straight winless tourney appearances before a single win in 2008 and the stunning championship run in 2009. Heather Pearson credited continuity, proper beer consumption and the team’s motivational player/coach, Deanna Hoy, for the sudden success. “We really had been practicing a lot, and it just finally started coming together for us. Once you start playing with the same people for long enough, you just kind of jell together, and we just sort of became the well-oiled machine that we had been trying to be. Photos by Joseph Robertia, Redoubt Reporter. Sarah Riley, of Kenai, paddles across tranquil Skilak Lake on Saturday, taking in the snow-swept mountains to the east. The kayaking trip, attended by 19 people, was part of an outdoor excursion planned by the Kenai Peninsula Outdoor Club. The deep, blue water of Skilak Lake was nearly as still as if it were still iced up, but the surface’s mirrorlike reflection of the few wispy cloud formations overhead was a telltale sign winter was over. So, too, were the ripples that trailed behind two thick-necked loons, whose crisp, black-and-white plumage was a stark contrast to their almost entirely blue surrounding. The larger-bodied male swimming in front of his female partner briefly dove underwater before slicing back to the surface with a wriggling fish in his bill. As he gulped down the meal, just a few yards away onshore lake-goers of a different sort were arriving. Vehicles were beginning to pull into the parking lot of the lake’s lower boat launch off of Skilak Lake Road. The loons moved away, but not before yodeling a low, “hooo-we-ooo” to the newcomers. Saturday was a rare, sunny and calm day on Skilak Lake, and the 19 people who showed up to kayak from Skilak down the Kenai River 12 miles to Bing’s Landing knew it the minute they hit the water that morning. 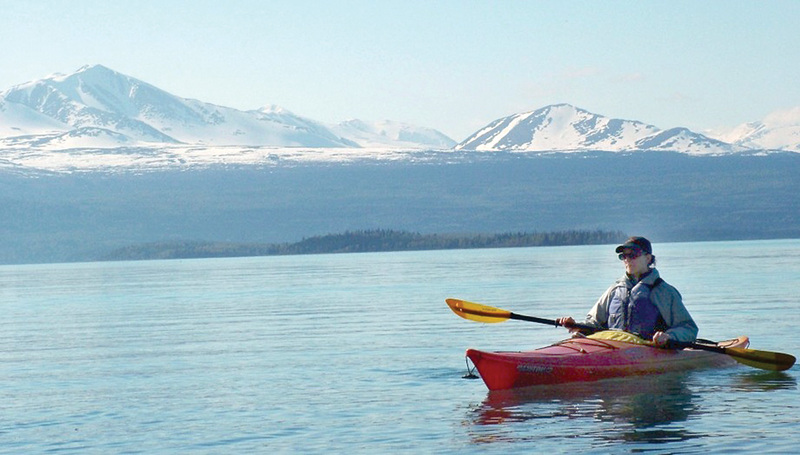 The outdoor club puts this kayak trip on its schedule every season, but the wind and weather can occasionally turn Skilak Lake into a dangerous chop of boat-flipping rollers, according to Steve Ford. Every person who thinks he or she has a fair grasp of the truth of things must one day be proven wrong. My day to be proven wrong came on my first mountain bear hunt. It was the spring of 2008 and my hunting buddy had spotted a big boar on a grassy knoll. He handed me the binoculars. Yup, it was a big ol’ black bear. “Let’s go!” I said. “That bear is a mile away,” he said. I followed him as he made a zig across the first incline. I followed as he made a zag. This is how the miners made their way up mountains, I thought casually. Not so hard without provisions. The next few zigs and zags came and went. Two errors became evident to me — this was not a hill and I was not going to run up it. Still, the vertical fields of wild geranium and the smell of mountain air were enough to take my breath away. Something was taking my breath away. I began to wonder when it would be an appropriate time to call for a break. My pack and rifle were too heavy for me to swing my arms inanely whilst professing that the hills are alive … . Then came the shale. Hiking boots are not made that can adequately navigate mountain slate that’s been waiting a hundred years like a loose tooth waiting to be pulled. As the author of this idea, I had to see it through, at least to phase II, which required skirting the tree line. I looked through the binoculars and found the bear to be moving away from our general direction. He was walking on shale and jaunting upward with ease. But I didn’t give up yet. We followed the bear across three valleys and lost him in a grove of trees. My sides ached, a blister was developing on my right heel, my socks had fallen into my arches, my gun had gained 20 pounds. My hunting partner seemed unfazed. He almost seemed smug. Some days you get the bar and some days the bar has a mile head start and you’re just a girl with too many musicals running through your brain and not enough common sense about footwear. It was another case of a great day without success, as defined by trophies won or lost. That day, and days like it, stand out to me as my greatest experiences in the field. When I finally get something right, it is better because of all the times I got it wrong. The hours spent are an investment into the total worth of the outcome. This year I went out on a boat with friends for the dual purpose of testing the boat and scouting for bear. My eyes were sore from glassing and the crew was disappointed when we were “pulled over” by Alaska State Parks officials who only checked our life vests when days of preparation would have proved we’d done a hundred other things right. The Parks boat sped away from us, and then came to a sudden stop. Photo courtesy of Christine Cunningham. 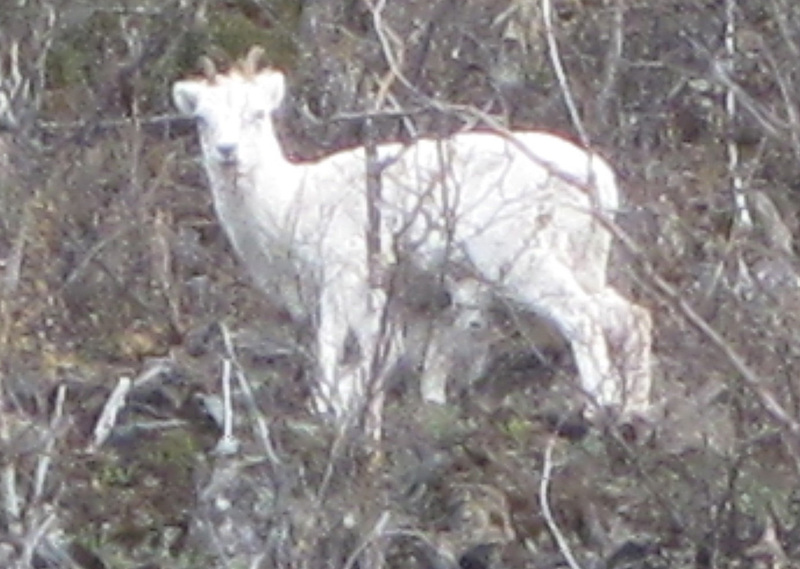 A Dall lamb peeks out from under its mother on a mountainside above the Kenai River. At the end of the day, without seeing a bear, I was glad to have at least gotten outside. I uploaded my photos to my computer and found something I hadn’t seen. Dall lambs are born in May or early June. Near the time for lambing, the ewes seek a protected spot that is safe to birth their lambs. The rugged cliffs we’d seen that day were a birthing area, and peaking out between the legs of his momma was a little guy with the face of a disgruntled cotton ball. At first I flinched at the proposition. It’s my position to stay above 90. But the 10 percent of the time I’m wrong, it’s the best kind of wrong — the kind that brings about a world of surprise and greater understanding. And, if I thought about it, 90 percent was probably generous. Christine Cunningham was born in Alaska and has lived on the Kenai Peninsula for the last 20 years, where she enjoys fishing, hunting and outdoors recreation. She can be reached at duckoholic@gmail.com. Week 5. Days blend despite our efforts to diversify our looping schedule. We switch off waking early and sleeping in, nap before night sessions. Weather shifts and eventful bird sightings have become useful ways to tell time. For instance, the big winds ended more than a week ago. This is the sixth straight day of sun. We saw six whimbrels five days ago. Three nights have passed between two earthquakes. The shorebird numbers seem low this spring, but the birds that are here, like us, prefer plot two, so that’s where we go. To access plot two, we immediately cross two slough trenches, walking or ferrying across on a pack raft, depending on the tide. This mud cake, cracked and powdered with salt, has baked and hardened, so it’s pleasurable walking, akin to the give of a rubber runners’ track. While gauging the day’s growth of glasswort and goose tongue starburst buds, I track coyote tracks and compare gull and crane trident prints. So far we’ve found 17 mew gull nests and one northern pintail clutch of seven eggs in a down-lined bowl. I found the first nest but I should report the score is: Grad student (my wife, Sadie) 16, technician (me) 1. Pairs of matched ducks and courting dowitchers flush out of pond compartments separated by spike rush as we approach one of plot two’s two large, permanent ponds. Plot one has none and all but a couple of its ephemeral pools have drained. The reedy grunts of pectoral sandpipers have been replaced by the similar gruff calls of red-necked phalaropes. The former have moved on to their arctic breeding grounds, while the phalaropes are settling in here, courting around like rubber duckies and preparing to nest. This development, as well as the drop-off in all other shorebird numbers, indicate the spring migration has come and gone. Among the array of bathing ducks and gulls on a pond, we’ve counted as many as 82 red-necked phalaropes. 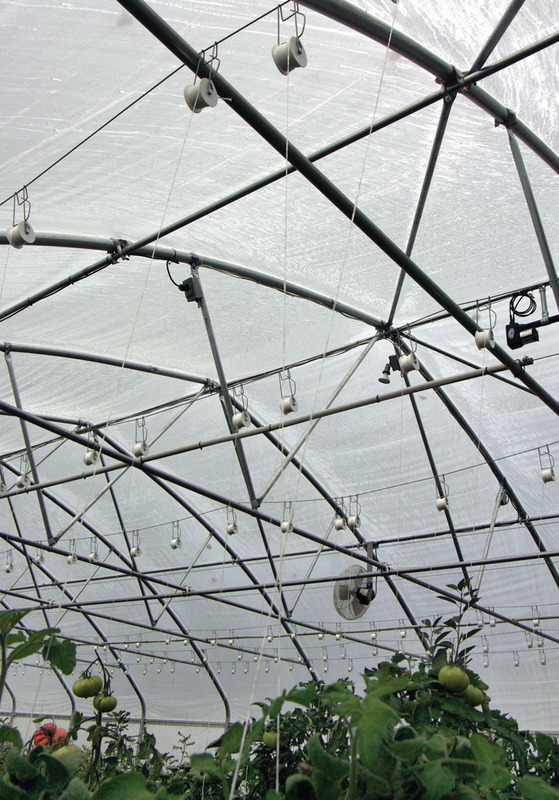 All three of our drop nets are set up here. I am new to hunting, as well as scientific fieldwork, but trapping appears to have more in common with the former. Sound strategy can serve as insurance for poor luck. After observing birds foraging and betting where we think they will forage in the near future (areas that will remain wet), we erect a net. Tensioned to four metal fence posts, the 5-by-11-meter rectangle stretches 1 meter off and parallel to the ground. We run an anchor line 50 yards back, set it in a cleat and wait. And watch. I prefer hunting from a stand or blind to stalking because I can concentrate on silently listening and almost blend into the terrain. Wildlife carries on as if I’m not there. Foraging arctic terns splash in nearby puddles. A savannah sparrow flits by and perches so close that I don’t need binoculars to see its yellow lores. Dowitchers fly in and out of ditches, pitching calls that sound like “Star Wars” lasers. When any bird wanders near the net — or, “we have a customer” — adrenaline begins to drip. So you can imagine the thrill we experienced about a week ago when, first arriving at our net, we saw a pair of Pacific golden plovers sitting pretty at the front, right post. This species is this season’s only life bird for both of us. Dreaming about having such a dapper, black-and-white shorebird with a gold-dappled cape in hand, we forgot to take a photo. Not in my hand, I might add. When releasing the one bird I practiced holding — a 27-gram least sandpiper — I flinched. Our patience, while dug in minding the net, has paid off with three rapturous raptor viewings. A northern goshawk, banking sharply to clamp to a stump. On an overcast day that resembled late evening this time of year we watched a short-eared owl hunt and perch to dine at 3 p.m. A peregrine falcon worked the same area. For close to five minutes we watched it flap laps before finally arrowing down to display the cruising speed for which it is notorious, flushing all the birds within a mile radius. From the trapping site we also sighted 60 lapland longspurs undulating above fresh foliage, twice as large as the biggest shorebird time step we’ve seen. Photos courtesy of Jackie Mouser. 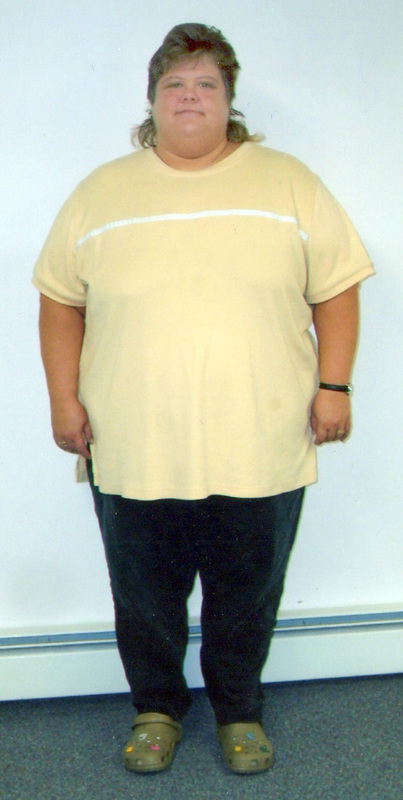 Jackie Mouser, of Soldotna, lost more than 200 pounds through diet and exercise, from 357 pounds to 150 pounds. She was named the TOPS 2009 Alaska State Queen for her weight loss. Some queens are born to the position. Others win it through battles and wars. For Jackie Mouser, of Soldotna, her enemy was herself. In a battle for health and happiness Mouser conquered her old habits and freed herself from excess weight of over 200 pounds. It had been a vacillating battle all her life. Mouser spent her childhood in Anchorage and moved to Soldotna when she was 10 years old. “My earliest memories of dieting began in junior high. 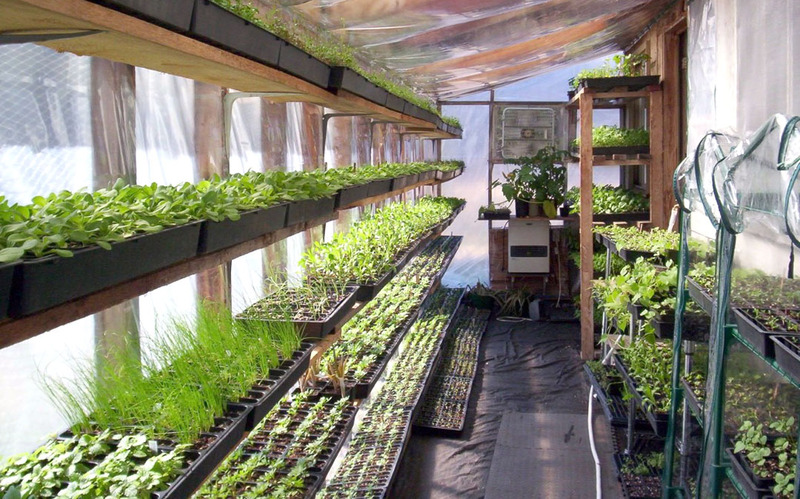 By the time I started my freshman year I was on a popular vitamin diet, skied, swam and hiked. I was always busy and was a slender 135 when I graduated,” she said. Over the next 29 years, Mouser stayed in Alaska and, for a time, worked alternating shifts on the North Slope. The food there was abundant and always available, as her increasing weight could attest. She later got a job as a fast-food restaurant manager and added more pounds. In a third strike, her doctor discovered Mouser had a medical condition that complicated her weight gain. She met her husband, Roger, when she weighed 225 pounds, and gained another 25 in the year before their marriage. After the wedding she gained another 100 pounds and wore size 5X. Her medical condition prevented them from having children, so the Mousers turned to adoption. One week before they were to receive a child the adoption fell through and Mouser fell into a deep depression. “Thinking that my weight had something to do with it I applied for gastric bypass surgery and was turned down. It seemed my sense of failure was being compounded daily,” she said. Mouser now weighed over 357 pounds. She decided she’d had enough. It was time to turn the tide. She started seeing a dietician and slowly lost 30 pounds. The dietician recommended a support group and Mouser remembered that her friends, Don and Peggy Edwards, were members of such a group and had lost a lot of weight. In September 2007, Mouser joined the weight-management support group Taking Off Pounds Sensibly, choosing her friends’ chapter AK No. 164 of Soldotna. The Edwards got right to work. They told Mouser she had to start exercising. They run Edwards’ Boot Camp for their TOPS chapter, and told Mouser that if she missed a single day she would have to make up the workout. Considering her soreness after the first day, there was no way Mouser wanted to do double sets. She went faithfully to exercise class six days a week. “Boot bamp was torture,” said Lauri Bourdo-Winter, a fellow member of the chapter and exercise class. The same class that helped Mouser lose more than 100 pounds helped Winter lose around 30 pounds. Three months after joining TOPS Mouser had lost 48 pounds. 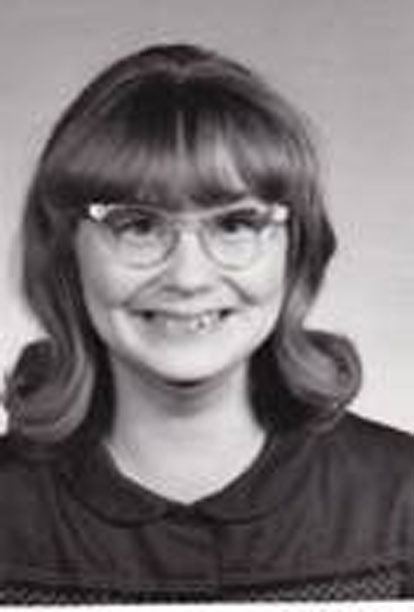 To the added thrill of her many friends at the chapter, her weight loss earned her Division I First Place at the annual TOPS State Recognition Days in April 2008. Mouser continued exer-cising and added hiking, biking and wallyball games. With the added exercising and watching what she ate, Mouser had lost 99.25 pounds by the end of 2008. 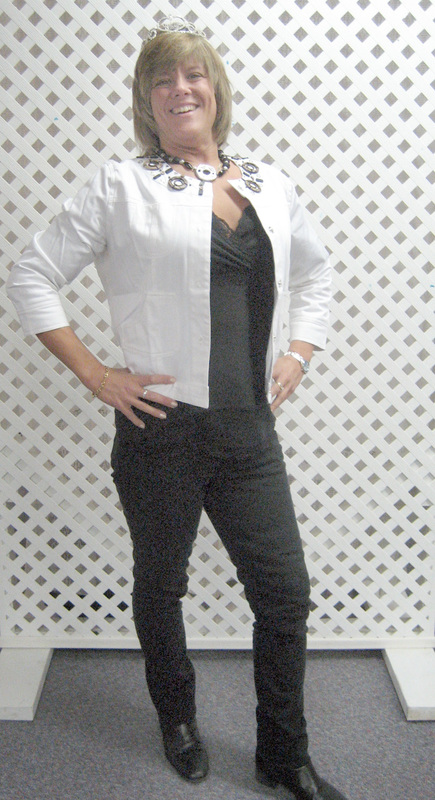 In May 2009 she celebrated one full year of successfully keeping off more than 100 pounds.